Six Palestinian detainees are engaged in an open hunger strike, in solidarity with women detainees of Hasharon prison, who have refused to leave their cells since last July, in protest of IPS security cameras in the yard. The Palestinian Prisoners Society (PPS), in a statement, said that detainee Abu Araam, from Hebron, and Hattab, from Tulkarem, have been on hunger strike for 16 days, now. 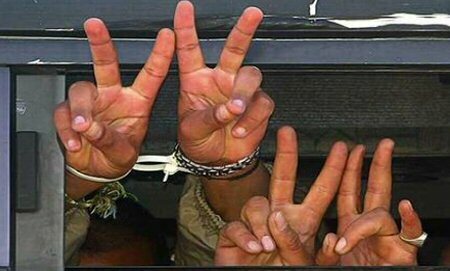 Another two detainees began their strike seven days ago. They are Abdulrahman Abu Lebda, from Gaza, and Ahmed El-Ser, from Bethlehem. Hattab has been detained since 2004. He was sentenced to life imprisonment for two terms, while Khalil Abu Araam is sentenced to life imprisonment for seven terms, and has been detained since 2002. Abdulrahman Abu Lebda has been in Israeli custody since 2007, and is sentenced to 11 years imprisonment. Detainee Ahmed El-Ser has been detained since 2013, and is sentenced to 6 years in jail. In the same context, Rezeq Rajoub, aged 61, from Dura, went on an open hunger strike for 14 days as a refusal of his administrative detention without charge or trial. PPS stated that Rajoub has been detained since 27 November, 2017, and has served 24 years in Israeli detention centers. He has went on hunger strike three times since his last arrest, for total of 24 days. Maher Al-Akhras, aged 47, from Jenin, has been on hunger strike for 8 days, refusing his detention and interrogation. It was indicated, according to Al Ray Palestinian Media Agency, that he is an ex-detainee, and has served four and a half years in Israeli jails. The family of detainee Sadam Awad said that their son suspended his hunger strike, which continued for 20 days, after coming to an agreement that determined the course of his administrative detention.